The USDA recently approved genetically modified (GM), Roundup-Ready alfalfa without any conditions and did an end-run around the courts to keep GM sugar beets growing. Both decisions were upsetting news for all of us wanting safe, uncontaminated food. But the two decisions came with a positive consequence. “The prolonged alfalfa and sugar beet fights actually elevated GMOs (genetically modified organisms) on our personal and national radar screens,” says leading non-GMO advocate Jeffrey M. Smith. “Now with millions of us grasping the significance and devastating loss of yet another crop, we have the pieces in place for a national revolution. We have the knowledge, the emotion, the network, and the profound injustice.” All we need now is focused action. And focused action is exactly what is happening. Would you like to explore the world of gluten-free living? Would you like to get a copy of my new book personally autographed by me? Or, if you know you’re sensitive to gluten (found in wheat, rye, and barley), would you like to go to an event where you can sample good food, have fun, and relax knowing all the foods there are gluten free? If you answered yes to any or all of these questions, you’re in luck. 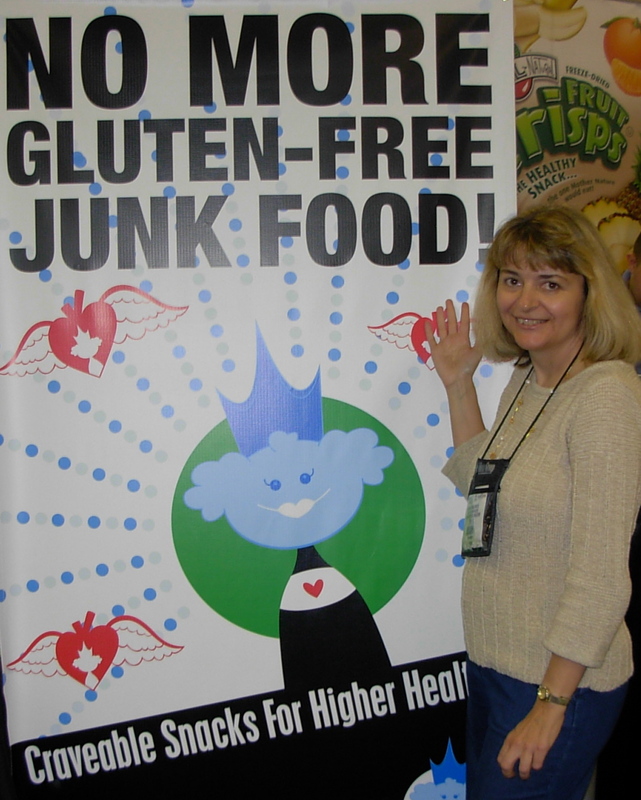 The Annual Gluten Free Food Faire, a special day of health information and food sampling including a book signing by me, will take place on Saturday, April 30th, from 10 a.m. to 2 p.m. at the Holiday Inn Palo Verde, 4550 S. Palo Verde Rd., in Tucson, Ariz. I absolutely loved this sign that I saw while walking the show floor at the natural foods convention, Natural Products Expo West! As you probably know, I’ve been writing for quite some time about how gluten-free junk food is making people who eat gluten free fat and unhealthy. In fact, getting that message out to more people is a big reason that I started this blog (see my original story “The Gluten-Free Diet – A Recipe for Unhealthy Weight Gain?”). It’s also one of the main reasons for my new book, Gluten Free Throughout the Year: A Two-Year, Month-to-Month Guide for Healthy Eating. “Ingredients for change” was the theme of a media luncheon this year at Natural Products Expo West, the largest natural foods and products convention in the world. It also symbolized what I saw at a number of talks, receptions, and food booths at the convention March 10-13, 2011. I wrote a few months ago about growing trends toward gluten-free, organic, and sustainable foods in the restaurant business. I’m glad to report that those trends are evident in the natural foods industry, too. There is also growing awareness about the hazards of genetically modified organisms (GMOs) and an increased push from many health food manufacturers and retailers to remove GMOs from their products and stores.